One way to look at the freemium business model is to look at it per user. A user will either use the free (basic) version, or for-a-fee (premium) version. By definition, a freemium model is where one user is faced with a choice – do I use it for free, or do I use it for a fee? We will look at how to encourage users to move from the free version to the for-a-fee version later. For now, we’ll just look at the impact of that choice. Every free user gets benefits, for free. Every for-a-fee user pays for the benefits of the product. The customers who pay for your product also cover the costs you incur when providing the service for free to other customers. As a company, you have to look at your aggregate user base to analyze the economics. Some percentage of your users pay for a product (premium), and another percentage do not (free). What makes this interesting is asking the question – “What percentage of your users will pay when a free version is available?” Basecamp, from 37signals just celebrated its 5th anniversary, and serves as a good illustrative example. Note that 37signals expressly does not share this information, so we have to speculate. In a 2006 interview with Ryan Carson for ThinkVitamin; Jason Fried, owner of 37signals, indicated that it was “more than 0.87%” – we’ll call that 1%. In a 2009 interview with Brad Spirrison for MidWestBusiness.com; Fried indicated that 90% of revenue comes from subscriptions to web applications. Spirrison points out that 37signals earns $40,000 monthly from their job board – so we’ll estimate $360,000 per month from subscriptions. We can sanity-check our 1% estimate. Fees for 37signals products range from $24 to $149 per month. If the average paying user pays $36 per month, then there would be 10,000 paying customers – 1% of a million. We could tweak the numbers (the average might be lower, there may be more than a million users, etc). But this data is consistent with a 1% conversion rate. Jed Christiansen did an analysis about a year ago where he estimated ~ $5,000,000 per year, with numbers very consistent with the Spirrison interview. Jed built his estimates up from the usage stats that 37signals reported (links at Jed’s article), and some assumptions for converting from usage to number-of-users. His estimates would put conversion somewhere around 0.5% to 1%. He provides a spreadsheet of the model too, if you want to tinker with it. This feels reasonable – 100 free users for every paying user. Even if that number is wrong, the rest of this article holds true, but it sometimes helps to have a number to think about. A company can offer a product for free to (primary) users, then charge advertisers (secondary users) to display ads to the primary users. A conference may offer the opportunity to speak/present (for free) to lecturers, then charge attendees to listen to the lectures. A government may offer waivers on corporate or property taxes to a company to build a new facility, then levee payroll taxes against the employees for the priveledge of working there. A shopping mall may host free events (like christmas pageants) to the general public, then charge the retailers for rental space in the mall. In each of these scenarios, the users who get the free product or service are not choosing it relative to the paid product or service. Different users are targeted for each. The first model (advertizing supported products) is easy for everyone to identify, but all of the examples share a commonality. Isolating the freemium business model from other revenue-generating opportunities, you can see that finding a profitable model can be tough – you have to control costs and set prices correctly. Assuming our data from above is representative (and I don’t know if it is), if 1% of customers are paying customers, then each paying customer has to cover the costs of 100 customers to have the possibility of being profitable. From a management accounting standpoint, for a given product, there are two types of costs. Fixed Costs – these costs are the same for the company, no matter how many users there are – additional (incremental) users add no incremental costs. Variable Costs – these costs are the same per user – incremental users add incremental costs. Total Costs – the sum of fixed and variable costs. There are also two important ways to look at profitability – overall, and per product sale. Total Profit – The sum of all product sales minus the total costs to make and sell the product (including overhead). Contribution Margin – The difference between product (or service) revenue and the variable costs to make and sell the product. Your business has $10,000 per month in fixed costs. Your product has a variable cost of $0.10 per month per user. 1% of your subscribers pay for their subscription, 99% subscribe to the free version. You price your product at $20 per month per user (per unit subscribed). That looks like a hell of profitable product – some people will pay $20 for something that costs you a dime. But looks are deceiving. You have to cover the costs of the free subscribers, and you have to cover the fixed costs of making and selling your product. 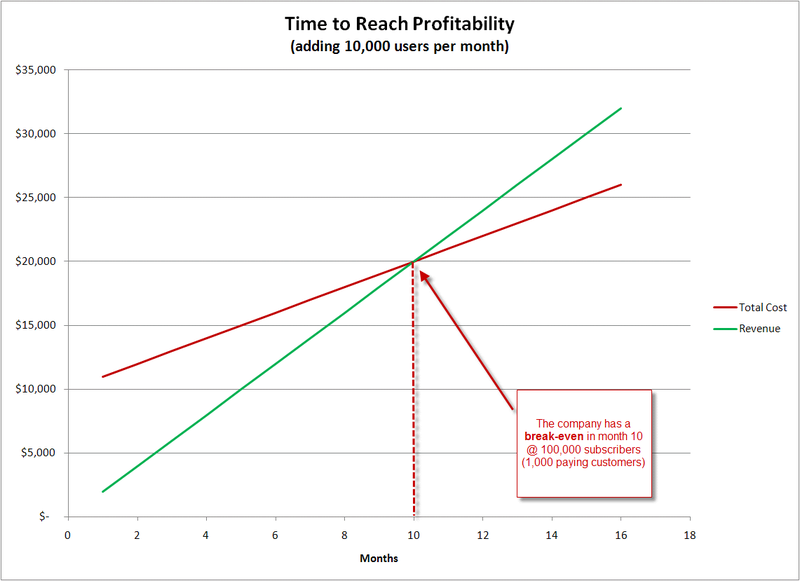 You have to get to 100,000 subscribers (1,000 paying customers) just to break even. This takes much longer than you would expect when selling dimes for $20! 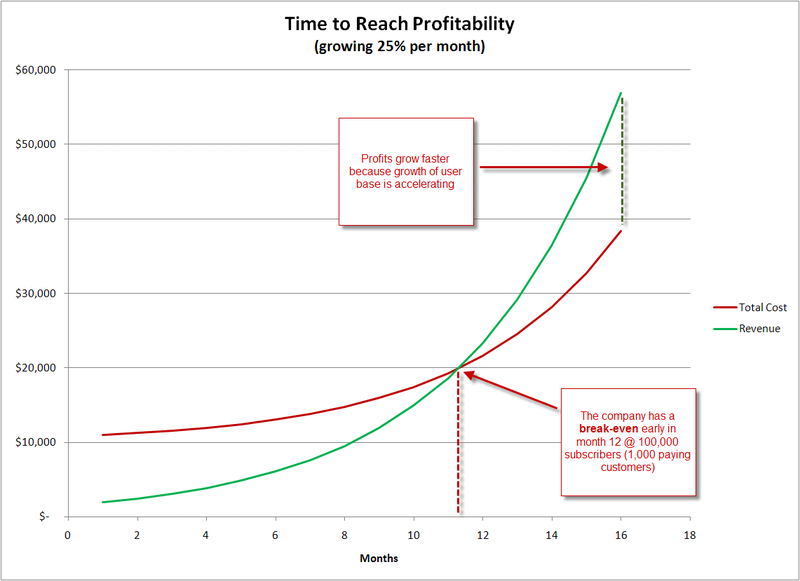 Even a 25% per month growth rate can’t help you early on. The exponential growth does start to compound, but it delays break-even. The reason this happens is that you have to pay for 100 free-account subscribers with the revenue from each paying customer. The contribution margin is the key here, and three things have to be true or you shouldn’t have a freemium business model. You have to have a contribution margin that is positive, when taking into account the ratio of free users to for-a-fee users. You have to have a sufficiently large user base (number of users – more precisely, paying customers) to cover your fixed costs. You have to lower your costs (if (1) is not positive or high enough) and grow your user base (if (2) is not large enough) fast enough to get profitable before you run out of funding. There are a two ways to grow your customer base – traditional marketing to grow your customer base, or word of mouth marketing to grow your customer base. If you’re relying on word of mouth marketing, there are two different dynamics that drive word of mouth [thanks to Jonathan Berkowitz of Thinktiv.com for this insight!] – altruistic and selfish. Altruistic – This product helps me, it will help you too. You should use it. Selfish – It helps me if you start using this product. You should use it. Discussion of the two different word-of-mouth patterns will have to wait for the next article. I’ll update this one with a link to that one when it is written. Hi Scott, thanks for this interesting posting. I was quite amazed by the low percentage of for a fee users at Basecamp. Is this an average percentage for products using the freemium model or is that a question that cannot be answered easily? Another question I have: what options do you have to persuade a free user to convert to a for a fee user? Another post maybe? Thanks very much for the comment! I don’t know if this is an average percentage (I just recently started researching it). And to be clear – we don’t really know if this is the percentage for Basecamp. A 1% conversion rate would be consistent with the other publicly available data I’ve seen – so this is entirely fact-influenced-speculation. I’m also early in the research process – Basecamp, being well known, and having just reached its 5 year anniversary, seemed like a good place to look first. If anyone else has anecdotal data, or suggestions on products to look at, please add theme here in the discussion section! On persuasion techniques – definitely another article :) I think this one was around 1500 words already, and I only wrote half of what I was thinking about. Hi, Scott. Thanks for the link to my post, and I’m happy to see that our estimates are in line with each other. I updated my numbers a couple months ago and now think they made ~$4million in 2007 and ~$8million in 2008… and they only just got to 12 employees! Thanks, Jed, for the additional data! Amazing that they can get that kind of scale from their people – a testament to the amount of automation involved in providing their support services. Good article at an opportune time – we’ve been considering a similar strategy. I created a spreadsheet to be able to make the same graphs you did, and I’ve got a question. Where do you account for R&D in a model like this? Is development fixed cost, because you only have to do it once? I’m having a hard time seeing it anywhere else, but maybe I’m missing something. @Patrick – thanks very much, and great questions. In this model, everything that does not cost extra per new user is a fixed cost (fixed relative to adding users). Not only would “before we ever get users” development be a fixed cost, but ongoing development would also qualify as a fixed cost. If you had to add call center staff as a function of the number of users – say 1000 to 1 or whatever, that would be a variable cost. The best way to deal with that is to estimate the per-user cost and allocate it – then revisit that allocation as you scale. Fascinating article Scott. Thanks for writing it. Thanks Craig! Any suggestions on other freemium products to look at? Very timely article for me Scott (only just picked it up I’m afraid!). I run a blog on business analysis which is in its early stages. I am starting to think about possible revenue models and this article provides me with some real food for thought. Of course, I don’t have a product yet but I’m thinking about that. @Alex: Thanks! I think you’re off to a great start with the first article on your blog, and I look forward to seeing more! Since you have a blog, you have a product. You’re sharing insights, and facilitating a discussion. It might not be a revenue-generating product, but it is a product. Good luck!